As a congregation grows numerically it typically initiates a building program eagerly anticipating the construction of a new temple. With the blessing of Archbishop Alexander (Golitzin) of Dallas, such an endeavor has been taken on by St. Barbara Orthodox Christian Church. Although the parish has consistently made the most of its all-purpose facility, it now looks forward to the day when a traditional structure permanently dedicated for worship will be consecrated. 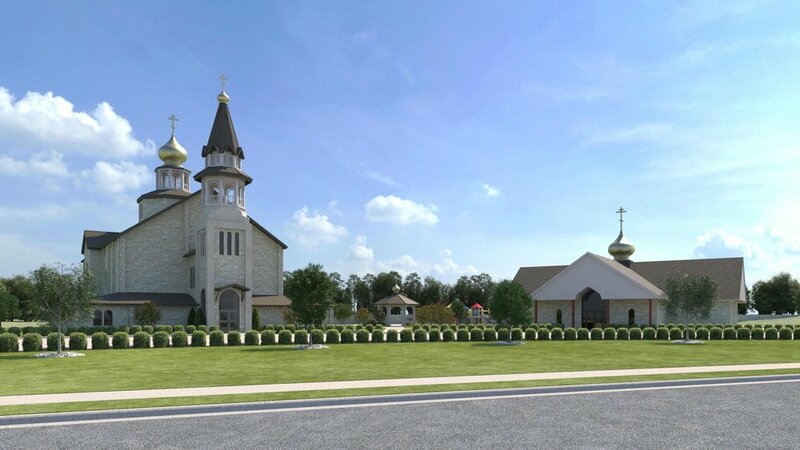 The new design and site plan fulfill a dream long shared by both Church members and Diocesan leadership, including His Eminence Archbishop Dmitri (Royster) of blessed memory, founding hierarch of the Diocese of the South. His Eminence who reposed in August 2011, was a faithful visionary who helped greatly with the community’s establishment. Upon blessing the current building in 2006, the Archbishop congratulated parishioners. He further encouraged them, however, never to forget the next necessary stage of development. St. Barbara’s initiated this stage a year and a half ago in collaboration with Mr. Michael Hoffer of the Ft. Worth architectural firm, Hahnfeld, Hoffer and Stanford. Within Orthodox Christian tradition beauty in worship is understood ultimately in light of the Divine Presence, as the experience of God Who is love itself, true beauty, acting in the midst of His people. The human response to this encounter is to bring to the Creator the best that may be offered as expressions of joy and profound gratitude. Such offerings naturally include various forms of art: hymnography and poetry, music, iconography and architecture. In all these, people seek to convey materially and creatively to the best of their abilities their appreciation of God’s glorious Kingdom revealed in and through Jesus Christ. “As long as Christians will love the Kingdom of God, and not only discuss it, they will “represent” it and signify it, in art and beauty…” (Alexander Schmemann, For the Life of the World, SVS Press, Crestwood, NY, 2002, p. 30). The present effort embraced by the St. Barbara Orthodox Community is born out of love. The congregation seeks to construct a traditional Church as a beautiful witness to Christ in our midst, “God with us” in the Person of the Promised Savior. In its labors the parish is focused on the distinct look of Russian Orthodox architecture. 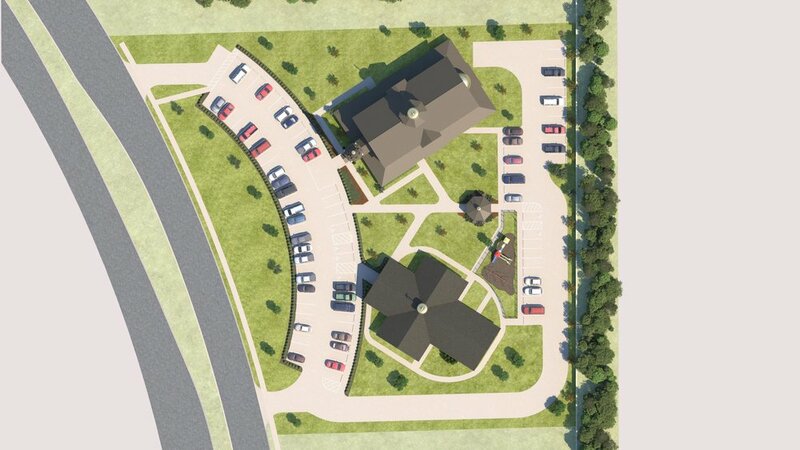 A specific goal guiding the community is a Church design that will both match and improve upon the straight-line design of the current facility for a coordinated look to the property. Russian Orthodox architecture lends itself to this effort. While promoting a distinct look, the plan is cost effective, placing expensive curvatures on the inside, rather than having the exterior follow interior lines of design. The process also allows for extra rooms, added space to enhance the community’s worship and other activities. Once completed the new structure will offer over seventy-five hundred square feet of protected space, including a covered sidewalk surrounding most of the Church. The twenty-five hundred square foot nave will accommodate two hundred and fifty worshipers comfortably. Although ambitious in scope, the future Church is designed with growth and development in mind. At this time, we invite you to join in this exciting endeavor, this offering of beauty for the glory of God. Our vision remains consistent with that of our forefathers and mothers in Christ, our “blessed founders who have gone to their rest before us.” We wish to provide an Orthodox Christian presence for all to experience in Southwest Ft. Worth, as well as an attractive structure to leave for future generations upon which they too may build and expand. First and foremost, prayers are greatly desired for this project. Remembering the joys as well as the challenges of the past, it is certain that we have come to this point in our parish’s history only by God’s Grace, and through the faith of St. Barbara’s parishioners and friends. We wish to remain true to the blessings bestowed upon our community by moving ahead both prayerfully and carefully with the construction of the new facility. In addition, monetary contributions toward this endeavor will be necessary and gratefully received. On-line donations may be made through the parish website: www.saintbarbarafw.org. Checks may be earmarked New Church or Temple Contribution, and offered either at the Church itself or sent by mail to: St. Barbara Orthodox Church, 5201 Altamesa, Ft. Worth, Texas 76133. Gifts are tax deductible. 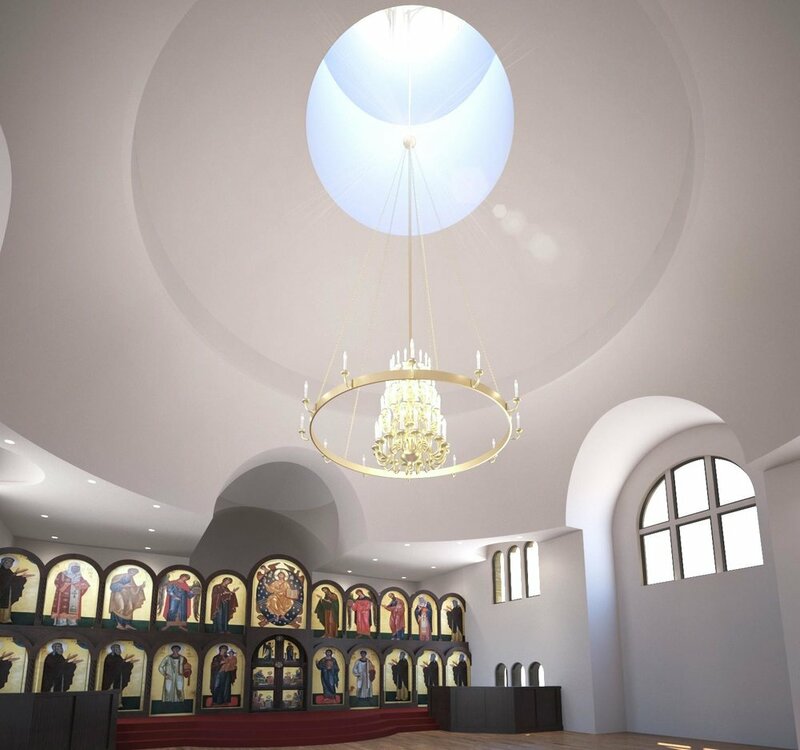 We look forward to the day on which the first Divine Liturgy will be celebrated in the new temple and to its consecration. We thank everyone in advance for their prayers and support. “The Lord said…from every man whose heart makes him willing you shall receive the offering for Me… And let them make Me a sanctuary, that I may dwell in their midst…” (Exodus 25 :2,8). (Church renderings may be viewed also at www.hahnfeld.com. The community is grateful to Mr. Michael Hoffer and his associates at Hahnfeld, Hoffer and Standford. St. Barbara’s also thanks iconographer Vladimir Grygorenko for iconostasis rendering. Please view www.orthodox-icon.com).